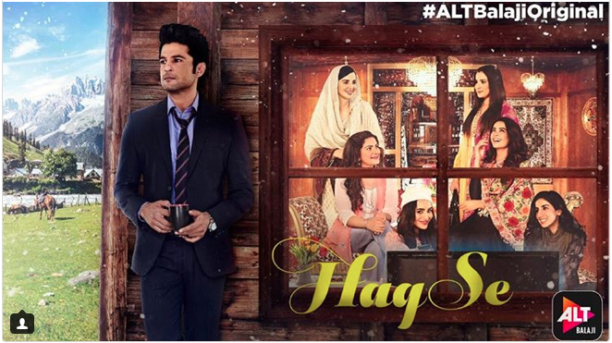 Alt Balaji’s newest web series Haq Se starring the charming pair Rajeev Khandelwal and Surveen Chawla will be releasing on the platform soon. In order to give the series a cinematic feel, the makers, Manor Rama Pictures, shot in real life locations like Manali and also created several elaborate sets in Mumbai. “We shot for over a month in Manali. The actors have worked extremely hard and trekked up and down the mountains; there were times when there was no access to cars or buses and everyone adjusted so much. Each and every actor on the show has been so diligent, from being ready on time in the freezing cold to giving top notch performances regardless of the temperatures. Each prop, every single thing was sourced locally from Kashmir or designed from scratch, same goes for every costume,” said Karan Raj Kohli, co-founder Manor Rama Pictures. Set in the backdrop of Kashmir, Haq Se is a story based on Little Women by Louisa May Alcott and tells the story of four sisters, their loves, their lives, and their ambition that is bound by the situation in Kashmir. The series will release on Alt Balaji worldwide in early 2018. 15 queries in 0.384 seconds.